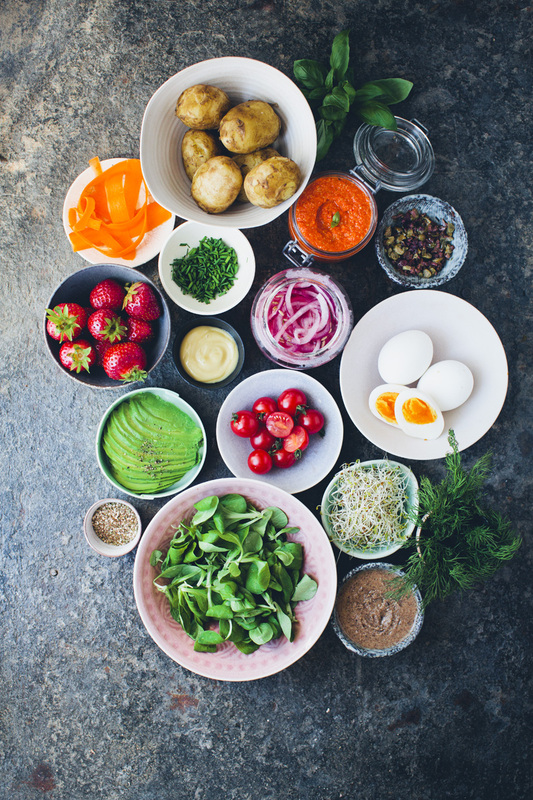 Smørrebrød – an open-faced rye sandwich piled high with toppings – is one of the most essential dishes in the Danish culture, most commonly eaten for lunch instead of a warm dish. 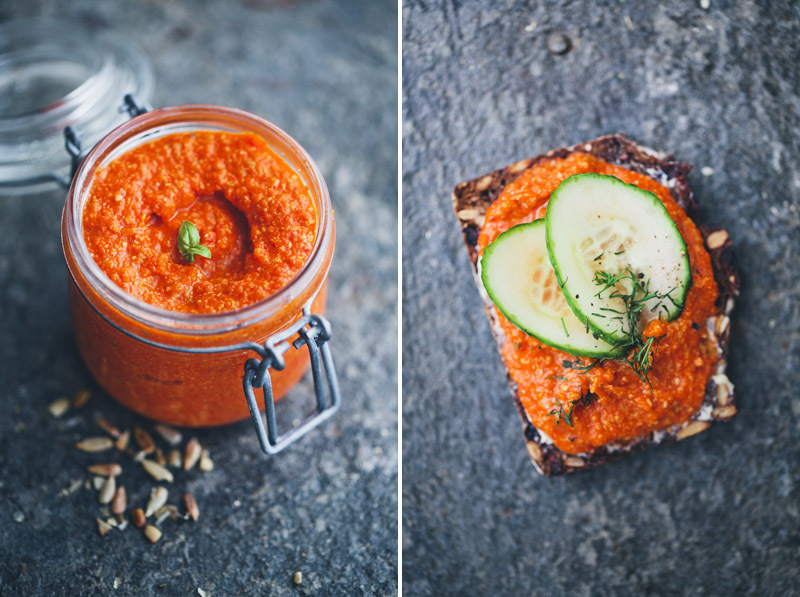 Growing up, I always had a piece of smørrebrød or a “klapsammen” (double sandwich) in my school lunch box, and now I have made it part of our family, even though we live in Sweden. What I like so much about this Danish tradition is that it’s all about the toppings. 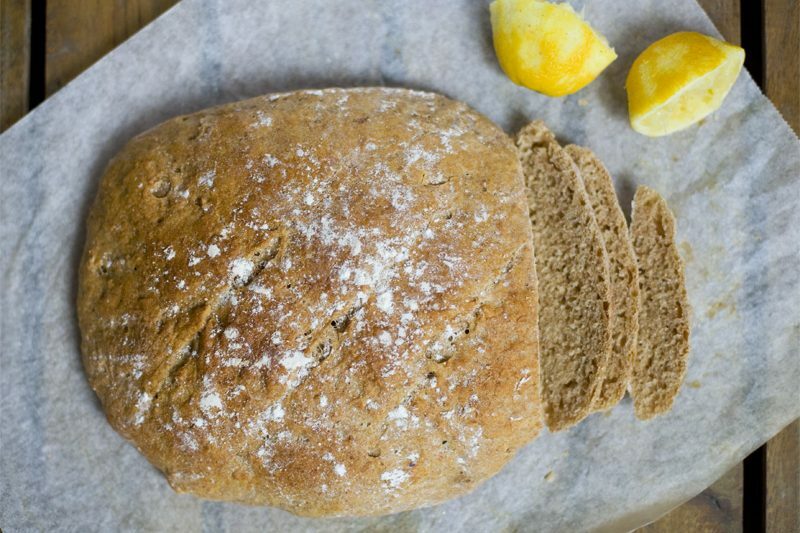 Of course you need a good piece of rye bread, but it’s the toppings that make it special. 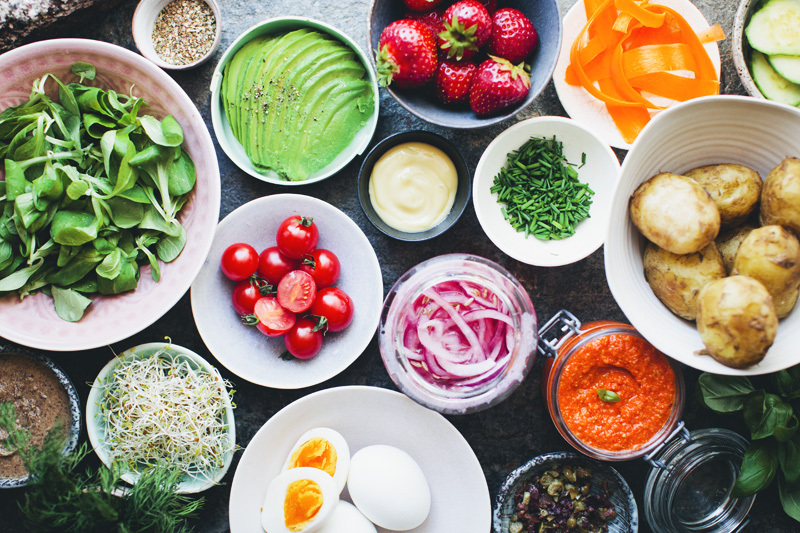 Traditionally, many of the toppings involve poultry, fish and meat, but here we are showing a few of our vegetarian favourites along with some more contemporary versions. The recipes aren’t as specific as we usually write them, since sandwiches rarely call for detailed instructions. 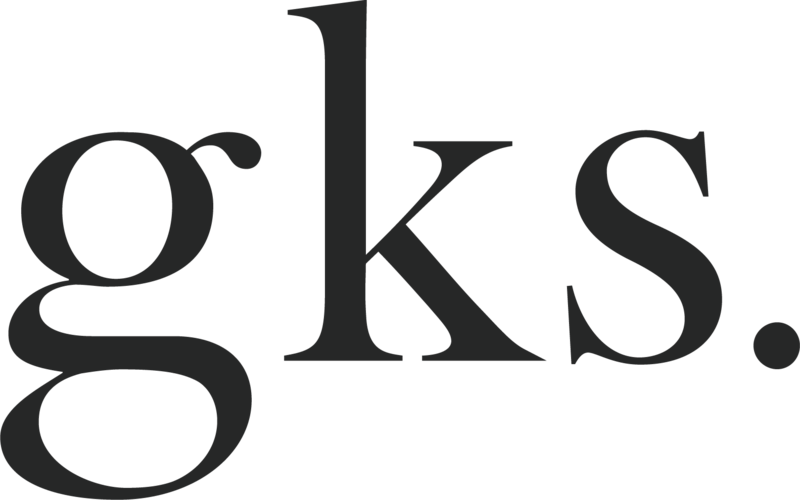 This post is more about inspiration. Our hope is that we can entice you to reach for something more than just butter and cheese next time you are making a sandwich. 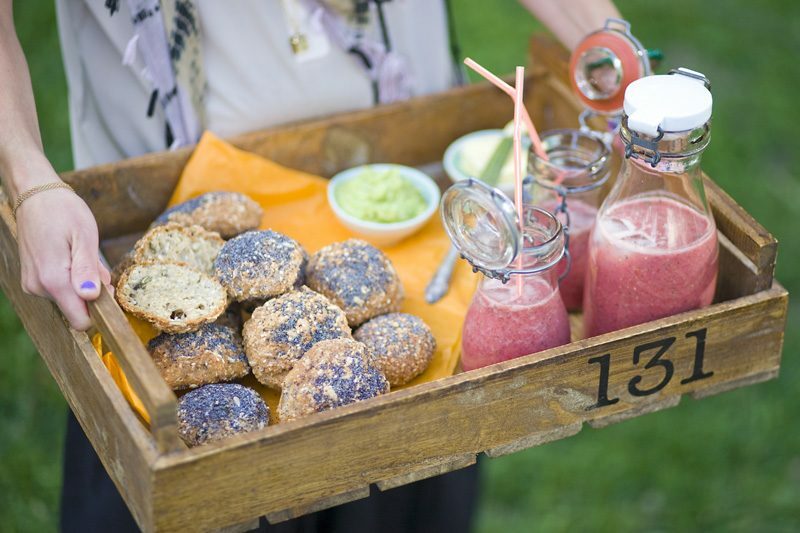 Smørrebrød buffet is also a fun theme for a brunch. Simply just bake or buy a good quality sourdough rye bread (or paleo bread for a flour free option). Then prepare a table with as many toppings as you can come up with and let every guest build their own open-faced sandwich. We are actually on our way to Denmark today to spend some time with my family. We plan to eat some Smørrebrød as well while we are there. Let us know what your favourite sandwich toppings are and we will make sure to include them on the table. Hope you are all having a wonderful summer! We love a good ol’ potato sandwich. Choose new potatoes if they are in season and remember that you don’t need to peel them, just rinse to remove any dirt and place whole into a pan of lightly salted water, bring to the boil, simmer for about 10-15 minutes or until tender. Then drain and leave to cool. 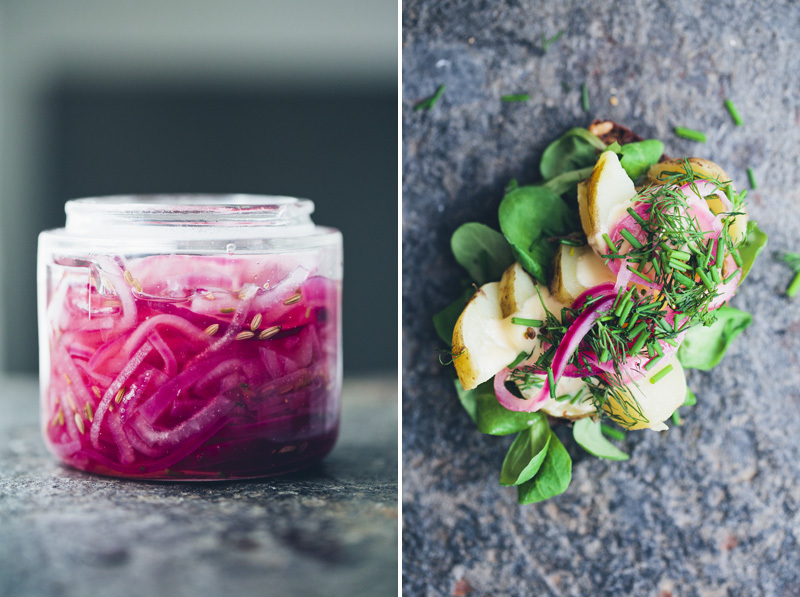 Cut in bite-size pieces and add to your sandwich together with mâche lettuce, mayo, quick pickled red onions, chives and dill. Mix 1/2 cup (120 ml) rice vinegar or white wine vinegar with 1 tsp honey and 1/2 tsp salt and 1/2 tsp fennel seeds or cumin seeds. Then we slice up 1 red onion thinly and pour boiling water over the slices before placing them in a jar with the vinegar. After 30 minutes it already tastes divine. 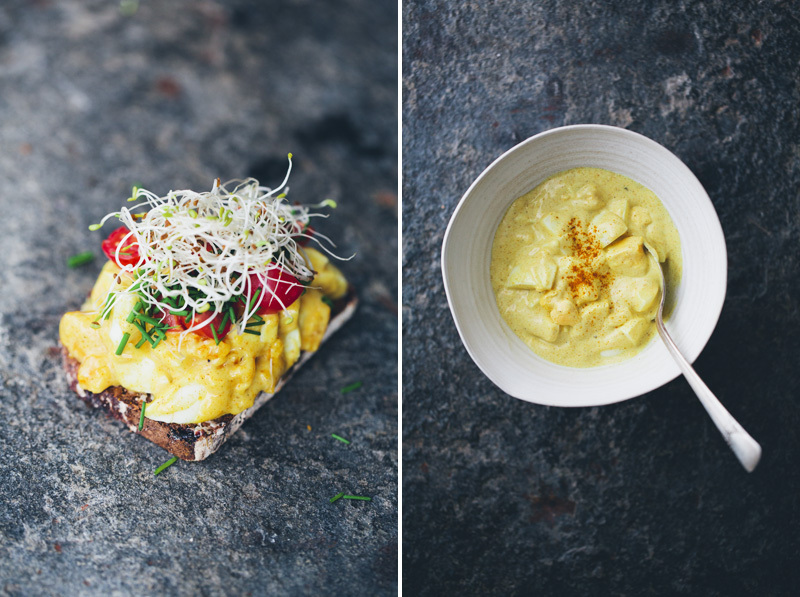 This creamy curried egg salad is so typical Danish. We serve it on rye bread with small cherry tomatoes, chives and alfalfa sprouts. It can get a little messy when you eat it, but don’t let that intimidate you from trying this classic. Place 4 eggs in a pan and cover with water, bring to the boil and set the timer for 8 minutes, lower the heat and let simmer. After 8 minutes, remove from the heat and place under running cold water. When the eggs are cold, crack and peel. In a bowl, stir together 2 tbsp mayo, 2 tbsp yogurt (or more mayo instead), 1 tsp curry powder and a pinch of salt. Taste and adjust the flavours to your preference. Now chop the boiled eggs and gently fold them into the curry dressing. The new queen of open-faced sandwiches and also one of the most popular subjects on instagram. Avocado is not a traditional Danish smørrebrød topping but always a welcome addition to our table. The key to this rye recipe is to use really ripe avocados. Cut the avocado in half, remove the stone, scoop out the avocado flesh with a spoon and slice very finely. Place each half on two slices of rye bread and give each avo a gentle mash with your hand. 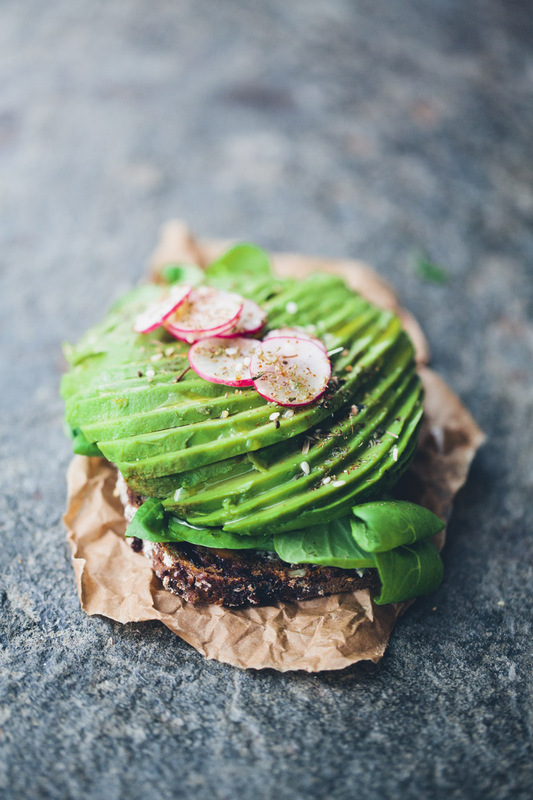 We are serving our open-faced avo sandwich with thin slices of radishes and a sprinkle of our favourite spice Za’atar. A perfect match! 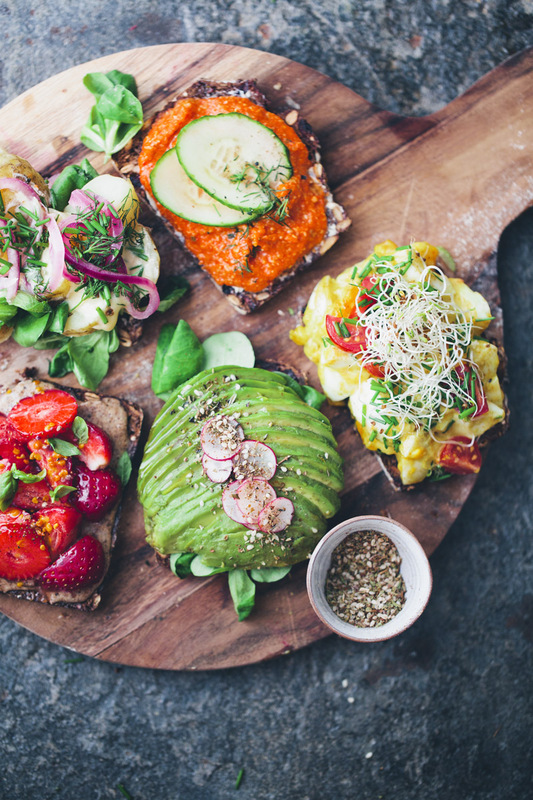 Lots of people have been asking us for a plant based spread to use on sandwiches. 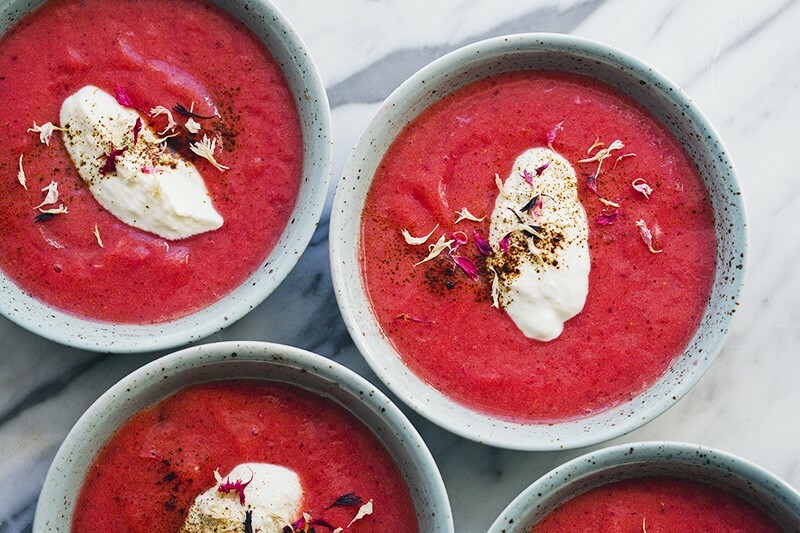 This popular recipe from our first book is one of our favourites. Apart from putting on a sandwich, it’s also great as a side to most dishes or together with pasta or zoodles. Preheat the oven to 200°C/400°F. Cut 3 large red bell peppers in half, scoop out the seeds and place on a baking tray. Roast for 40 minutes until slightly charred. Remove from the oven and leave to cool. Add 2/3 cup (75 g) sunflower seeds, a pinch of cayenne and a pinch of salt to a frying-pan and toast for a few minutes on medium heat. Peel the skin from the peppers, chop and put in a blender. 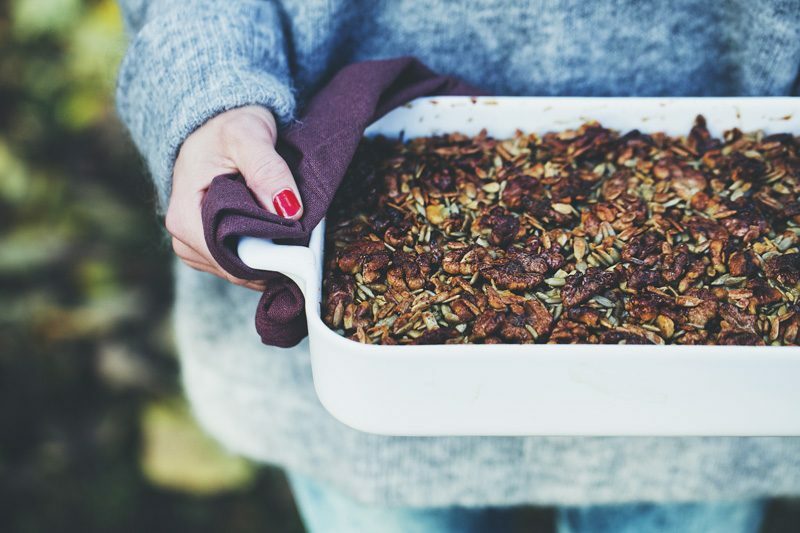 Add the sunflower seeds, 2 tbsp lemon juice and 2 sprigs rosemary and purée on high speed. Put in an airtight glass jar. Will keep in the fridge for up to two weeks. Not all our sandwiches are savoury. This is a modernised version of the classic peanut butter & jam sandwich. 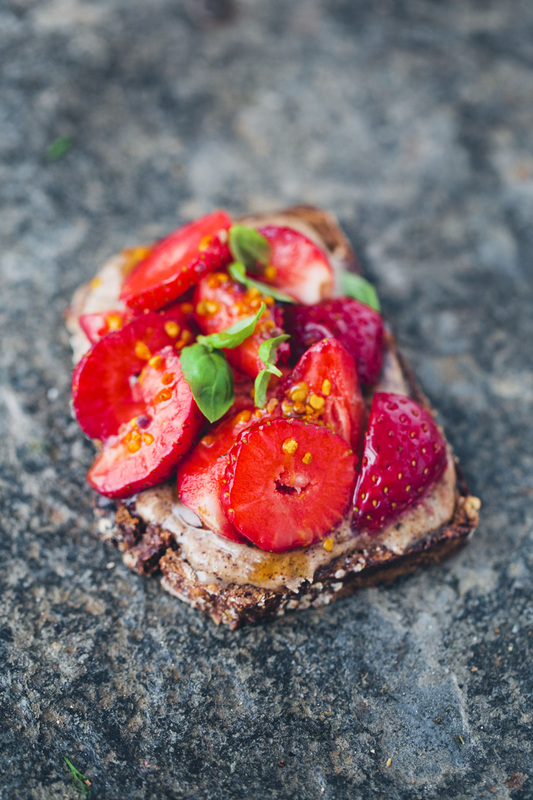 Hazelnut butter, sliced strawberries, a drizzle of honey or maple syrup, a sprinkle of bee pollen and some fresh basil. Delish! Buy nut or seed butter in stores or make your own. What beautiful food. Gorgeous. Makes me want to go and make it all. Sign me up for a creamy curried egg salad sandwich, it looks delicious! You always do such a good job blending tradition with contemporary. Your creativity is something else. What a great idea to put this out for a brunch. I'm loving the avo za'atar and the pickled onion topping. i just finished dinner, and I am not hungry... But I would do some damage at a table with all these options. Saving this inspiration - some good summer lunches are ahead for me - probably doing the egg salad one first! Oh my goodness, whatta spread!!! I already make all of these except the curried egg. Good choices! Just in time for lunch! ;) I will probably have a hard time picking one, because they all look sooo good! These all look incredible! I'm a big lover of the avocado one and the red pepper dip sounds amazing, especially with some crudites!